The University took the next steps in the historic expansion of its faculty, a process that will create an estimated 60 new appointments across the institution for tenure-track and tenured faculty—the first such efforts in decades. In June, Provost Thomas F. Rosenbaum announced that his office had reviewed and accepted the first round of recommendations for 22 new assistant professor positions from a multidisciplinary committee that included the deans of the College, Divinity School, and Divisions of the Humanities, Physical Sciences, and Social Sciences. Searches for the new appointments were authorized to begin in July and may remain open for up to five years so that the best scholars can be identified. The 22 new positions were selected based on the belief that they will result in academic divisions and schools that are stronger and more robust across a broad spectrum of disciplines. 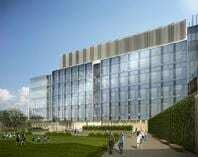 The William Eckhardt Research Center, scheduled for completion in early 2015 The University faculty approved the creation of a new Institute for Molecular Engineering. The institute will help develop the University as an intellectual leader in this emerging discipline, bringing to bear its tradition of intellectual rigor and cross-disciplinary scholarship on questions of scientific importance and societal urgency. The resulting innovations are likely to deliver solutions to the most pressing human problems, including energy supply and human health. Molecular engineering involves the incorporation of synthetic molecular building blocks including electronic, optical, mechanical, chemical, and biological components into functional systems that will impact technologies from advanced medical therapies to quantum computing. The institute will be housed in the new William Eckhardt Research Center (see Campus and Facilities), named for William Eckhardt, SM’70, who committed $20 million to support the Division of the Physical Sciences. There will be an international search for a director.